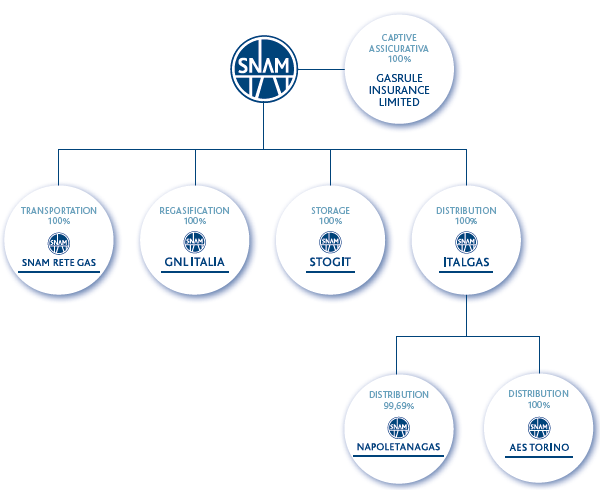 As an integrated operator in the management of gas infrastructures, the Snam Group is engaged in the transportation and dispatching of natural gas, the regasification of liquefied natural gas, and the storage and distribution of natural gas through four wholly-owned subsidiaries of Corporate Snam S.p.A.: Snam Rete Gas, GNL Italia, Stogit and Italgas. As at 31 December 2014, the scope of consolidation changed from its structure at 31 December 2013 following the inclusion in July 2014 of Gasrule Insurance Limited, a captive insurance company with registered office in Dublin, and of Azienda Energia e Servizi Torino S.p.A. (A.E.S. ), a company operating in the natural gas distribution sector; both of which are wholly-owned by Snam (the former, directly, and the latter indirectly through Italgas).